Sign up for our free newsletter! It's jam packed with info to increase speed, agility, quickness and soccer skills development. Please check your email after subscribing to confirm. Soccer is the world's most popular sport. Even in the USA soccer is played by youth players all the way up to the professional ranks. WIth the large number of people playing soccer all over the world its important to understand how to prevent injuries and improve performance. Critical to this end is understading the stretching and flexibility exercises for soccer. The demands of the game require you to train in such a way that you improve these areas. If you currently train for soccer by running mile after mile after mile you are going about it in the wrong way. Doing this may cause diminishing results to the very important physical aspect of soccer: SPEED. Research has shown that by doing long distance running you can diminish your power. If your legs are a step slower you might switch from long distance running. This is the ability to stop in the fastest possibly time while maintaining control of your body to react to the next stimiulus as quickly as possible. Ok, so that is my definition. Think about it this way. Your objective is not to have your feet planted in the ground as quickly as possible while you are falling over. You must stop and be under control so if an opponent cuts to go by you; you can react appropriately. The soccer athletes that can decelerate the fastest under control have a huge advantage. This is the ability to increase your speed in the fastest way possible. The ability to accelerate the fastest means getting to the ball first, guarding defenders better, and being the best goalkeeper you can be. Cutting is in between deceleration and acceleration. Its when you move one direction, decelerate, cut, then accelerate. The muscles work to move the body forward, kick the ball, cut faster, guard opponents and more. In order for the body to reduce injury and maximze performance, stretching muscle be part of training for soccer. Lets start with some of the main muscles required in soccer. How does Stretching Affect Soccer Performance and Injury Reduction? Stretching puts your body into proper alignment, wakes up the muscles and optimizes it for performance. A body that is not optimally stretched will be more susceptible to injury. As a soccer player if you are injured you cannot play. Common injuries affect soccer players. So put the time to develop a solid flexibility base. Theorectically speaking, I think kicking with power is affected by flexibility. 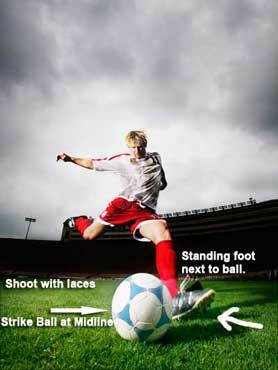 Look at the picture to the right of a soccer athlete kicking the ball. Observe how far his kicking leg is able to go back. Its fully loaded and ready to kick a massive shot. There are times when this is needed, so proper hip flexor and quad flexibility is vital. Because stretching is critical for soccer here are some guildelines and examples to follow. Coaches, players and parents should make sure these stretching routines are implemented consistently. Some of these stretches will be very difficult to do before games and practice, so it should be encouraged that the athlete do some of the stretches on his/her own time. That being said, for most practices and games you may not be able to foam roll. If you can great. Most people will probably look at you funny because no one does it. If you cannot foam roll before practice and games skip it. Pubmed - Prevalence and etiological factors of sport-related groin injuries in top-level soccer compared to non-contact sports. Pubmed - Intrinsic risk factors for groin injuries among male soccer players: a prospective cohort study. © EST Sports LLC All rights reserved.